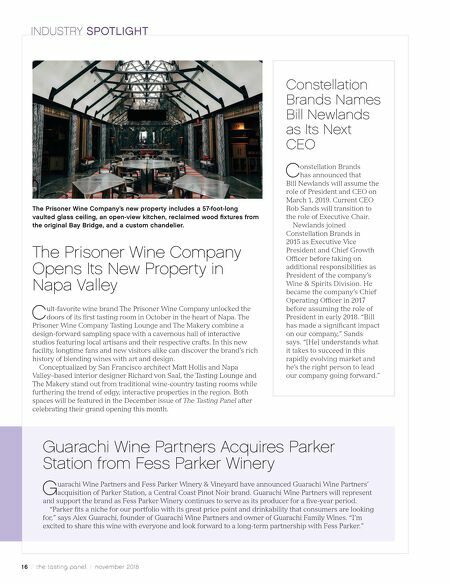 16 / the tasting panel / november 2018 INDUSTRY SPOTLIGHT The Prisoner Wine Company Opens Its New Property in Napa Valley C ult-favorite wine brand The Prisoner Wine Company unlocked the doors of its first tasting room in October in the heart of Napa. The Prisoner Wine Company Tasting Lounge and The Makery combine a design-forward sampling space with a cavernous hall of interactive studios featuring local artisans and their respective crafts. In this new facility, longtime fans and new visitors alike can discover the brand's rich history of blending wines with art and design. Conceptualized by San Francisco architect Matt Hollis and Napa Valley–based interior designer Richard von Saal, the Tasting Lounge and The Makery stand out from traditional wine-country tasting rooms while furthering the trend of edgy, interactive properties in the region. 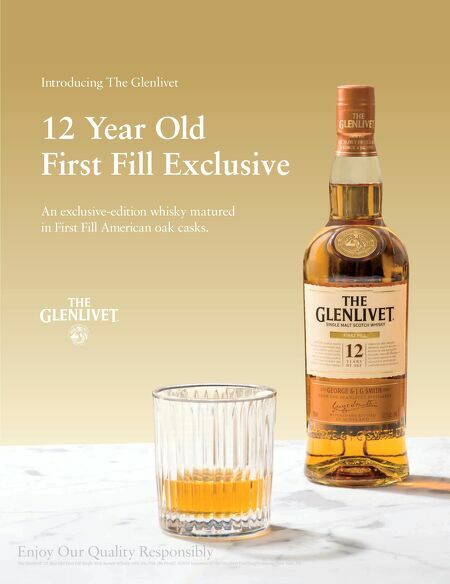 Both spaces will be featured in the December issue of The Tasting Panel after celebrating their grand opening this month. The Prisoner Wine Company's new property includes a 57-foot-long vaulted glass ceiling, an open-view kitchen, reclaimed wood fixtures from the original Bay Bridge, and a custom chandelier. Guarachi Wine Partners Acquires Parker Station from Fess Parker Winery G uarachi Wine Partners and Fess Parker Winery & Vineyard have announced Guarachi Wine Partners' acquisition of Parker Station, a Central Coast Pinot Noir brand. Guarachi Wine Partners will represent and support the brand as Fess Parker Winery continues to serve as its producer for a five-year period. "Parker fits a niche for our portfolio with its great price point and drinkability that consumers are looking for," says Alex Guarachi, founder of Guarachi Wine Partners and owner of Guarachi Family Wines. "I'm excited to share this wine with everyone and look forward to a long-term partnership with Fess Parker." Constellation Brands Names Bill Newlands as Its Next CEO C onstellation Brands has announced that Bill Newlands will assume the role of President and CEO on March 1, 2019. Current CEO Rob Sands will transition to the role of Executive Chair. Newlands joined Constellation Brands in 2015 as Executive Vice President and Chief Growth Officer before taking on additional responsibilities as President of the company's Wine & Spirits Division. He became the company's Chief Operating Officer in 2017 before assuming the role of President in early 2018. "Bill has made a significant impact on our company," Sands says. "[He] understands what it takes to succeed in this rapidly evolving market and he's the right person to lead our company going forward."